With Fair Saint Louis less than three weeks away, it’s not too early to plan ahead and start thinking about how you’ll get to the fair in Forest Park this year. 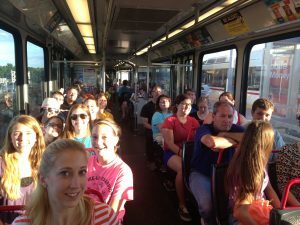 Metro transit is a great option if you are going to the fair, working at the fair or volunteering at the fair July 2 to July 4, and want to avoid traffic congestion, street closures and parking issues. Like last year, we’re asking you to access the fair by using one of two key MetroLink stations, the Forest Park-DeBaliviere Station and the Skinker Station. 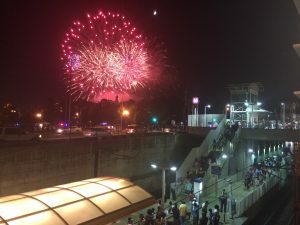 This will help minimize waiting times, passenger congestion, and help make it as smooth as possible getting you back on the train after the fireworks show end each night. For Blue Line passengers, please exit at the Skinker MetroLink Station when you arrive at the fair and then go back to the Skinker Station to board MetroLink when you’re ready to go home. For Red Line passengers, please take MetroLink to the Forest Park-DeBaliviere Station when going to the fair and then come back to the Forest Park-DeBaliviere Station when you want to go home. The Park-Ride lot at our Forest Park-DeBaliviere MetroLink Station will be closed during Fair St. Louis, however the other 19 free Park-Ride Lots at MetroLink stations in Missouri and Illinois will be available for fairgoers. MetroBus is also another good option for traveling to the fair as most routes connect with MetroLink. You can create your travel plan early by using the Trip Planner. MetroLink trains will be crowded at various times during the three-day fair, so we ask that you be patient and respectful of your fellow passengers. Remember, no eating, drinking or smoking (including e-cigarettes) are allowed on Metro buses, MetroLink trains or on Metro property. Alcohol and firearms are also prohibited on Metro vehicles and Metro property, and no alcohol or coolers are allowed at the fair. We’ll provide more details about Metro service as we get closer to Fair St. Louis. I could not find anything about the shuttle locations. Does anybody know, if we take metrolink to skinker, as suggested by fairSTL, if there is a shuttle from Skinker to fair STL, and if not, how far the walk is to the fair? Colleen, we are not providing shuttle service to Fair Saint Louis from the Skinker MetroLink Station. There does not appear to be a free shuttle service that Fair Saint Louis is providing either; however, fair organizers are providing golf cart shuttles (near the gate entrances) for a fee. The Skinker MetroLink Station is about an half-mile from the fairground entrances.